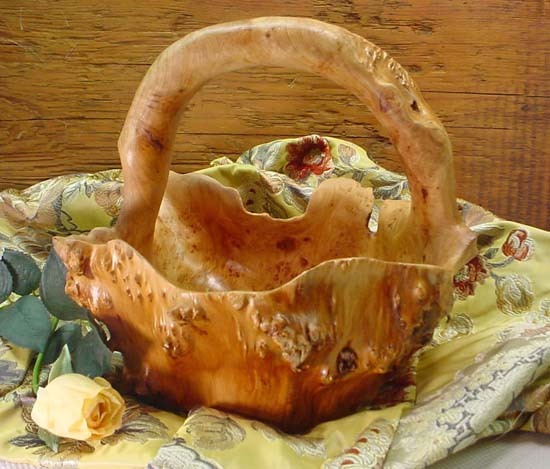 Cedar Root Basket - Small Discounts Apply ! This Small Cedar Root Basket is a natural wonder. This unique basket is carved and fashioned each from an individual and unique cedar root structure. Therefore each one will vary indefinately from the sample item pictured in this listing. They all have a handle. Like all natural the color and grain will vary. Most of these small baskets do not exceed a maximum width of 13" or a maximum height of 9" The average liquid holding volume of these baskets can be described as roughly 1/2 gallon, though they are only designed to hold dry materials.